Splash pages, you gotta love 'em. A blank canvas where the artist can hit you with a large dose of illustrated 'wow'. 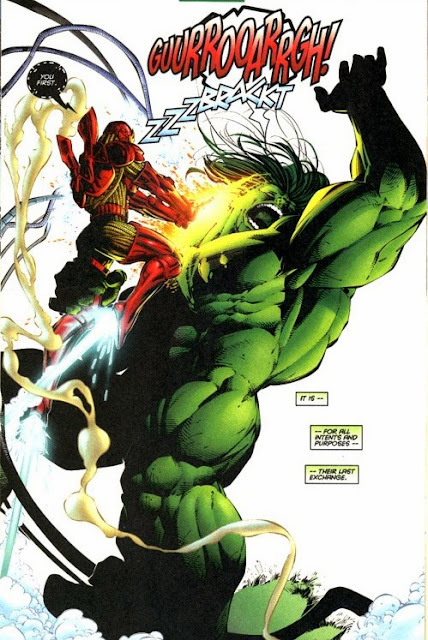 This week, I've said before how the initial issues of the Heroes Reborn Iron Man series was lightning in a bottle for the fact it tied artist Whilce Portacio, and the origins of both Hulk and Iron Man together - well they also featured killer splashies. One thing that Whilce doesn't get enough credit for is the effort he puts into design and composition. Now look at this page, see his art, and imagine 22 pages of it every month, chocka with Hydra terrorists. I tell you it was magic stuff. Whatever one may think of all that Heroes Reborn/Return nonsense, one thing I liked was Iron Man's funky new armor, plus the unusual 'fonts' way his word balloons were drawn. It made Iron Man look truly futuristic. Thanks mate - and the way Whilice drew Madamme Hydra still stands as the defining look for the character for me to this day.